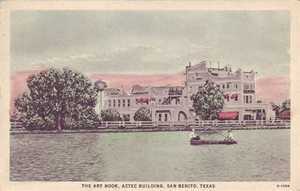 Aztec Building, San Benito, Texas. Once in a while a truly unique building gets built. 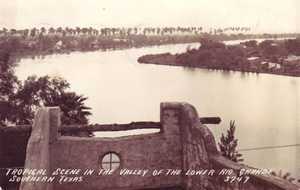 Perhaps it was the brainchild of a Winter Texan's fervid imagination - or perhaps it was someone wanting to built tall on a small lot to fully utilize the beautiful view overlooking the water. Was it a contractor fufilling an order from a Yankee owner - or was it simply built to attract customers and be the talk of the town? "The Art Nook, Aztec Building, San Benito, Texas"
Although it is currently occupied, the building still remains something of a mystery. It has had at least four incarnations - as a restaurant, an artist's retreat, the San Benito city hall and (currently) offices for Los Ninos - an adoption agency. 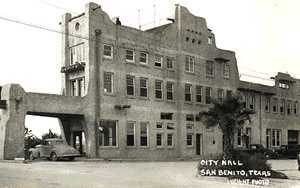 We encouage San Benitites to send in any memories they may have of the Aztec building - whether they include getting a permit, attending art classes, eating a memorable meal, dancing on the rooftop or all four. Contact us.